The Fellowship was fortunate enough to obtain a copy of THE MIGHTY CRUSDAERS #4 from Archie Comics’ Dark Circle imprint. The story is written by Ian Flynn; with pencils by Kelsey Shannon, inks by Kelsey Shannon and Ryan Jampole, colors by Matt Herms, and lettering by Jack Morelli. With half of the team down by the sneak attack by The Eliminators, The Shield must regroup the others and take the villains down before it’s too late. Meanwhile old man Shield must deal with Dino Rex who is loose after Crusaders Central suffers a system failure. The timing of all these incidents seems a little odd to be coincidental, but will our heroes survive to realize this? One of the complaints by the team members (and yours truly) was The Shield’s inability to be team leader. In this issue you see her make that big jump to be the leader the team (and the Dark Circle Universe) needs; not only with her quick thinking on how to take The Eliminators down, but in the aftermath. She visits every member, checks on them and be supportive and encouraging (just like another patriotic superhero). The book looks awesome. Shannon, Jampole, Herms, and Morelli are such a great team; I’d hate to break them up. You may argue there are too many capes and cowls books out there, but I really to see more of this team, both characters and creators. You should definitely check it out. 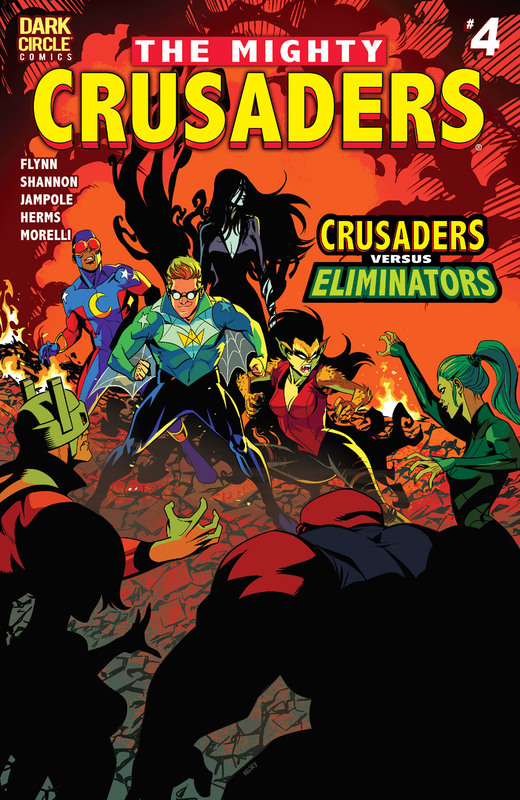 THE MIGHTY CRUSADERS #4 is in stores now or available at www.archiecomics.com.